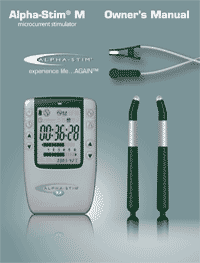 Watch these how-to videos for training on using the Alpha-Stim AID and Alpha-Stim M. If you have questions about how to use your device, free clinical support is available Monday through Friday from 8a-5p CST at 1-800-FOR-PAIN. Want more training videos? Access our full educational videos playlist by clicking the menu icon on the top left of the video player below. Then, choose the video topic that fits your need, such as 1-Minute Pain Protocol with Smart Probes or AS-Trode Electrode Treatment Strategies & Demonstration. Clean ear lobes with mild soap and water, alcohol pads or antibacterial wipes and allow skin to dry. Areas where skin oils or dirt have accumulated, or where cosmetics or hair spray have been used must be thoroughly cleaned to ensure adequate conductivity. Monitor skin condition prior to and after treatment. Skin irritation may develop in light skin. If skin burns are noted following treatment, discontinue use and apply an appropriate skin cream. Varying Earclip locations around the ear lobe may minimize irritation. Plug dual connector end of Earclip wires into jack on left side of the Alpha-Stim AID. Remove and discard old Earclip Electrode Pads (EEPS) if present. Remove old glue residue, clean and dry Earclips and attach 4 new EEPS. Note that EEP case opens with label on bottom. Saturate 4 new Earclip Electrode Pads (EEPS) thoroughly with several drops of Alpha Conducting Solution™ (ACS) while on Earclip electrodes. Mute the audio, if desired, with the key sequence: Lock-Timer-Lock. To reinstate the audio alerts press the same key sequence again. Set Timer. 20 minutes is usually enough time if the current is set to at least 250 μA. 40 minutes to 1 hour is recommended if the current is at or below 200 μA. Squeeze Earclips and apply one to each ear lobe. Current defaults to 1 (100 μA) when the Alpha-Stim AID is turned on. Increase Current slowly (5 is the highest setting) until a slight vertigo is experienced (a dizzy feeling, similar to the sensation of rocking on a boat), then decrease immediately until the dizziness stops. Also decrease immediately if the normal tapping sensation felt on the ear lobes is uncomfortable. For people who have a history of experiencing vertigo such as motion sickness, treat at a subsensory current setting of 1 (100 μA) for one hour or more to prevent residual vertigo after treatment. The tolerable current level will be determined by the subjective feeling of vertigo which should subside immediately upon reducing the current. The current should always be reduced just below the level that causes vertigo. Press Lock twice to lock settings, if desired. Press Lock twice again to unlock and change settings, if necessary. Relax, if possible, during the treatment. It is best to sit quietly or lie down although it is also possible to read, work at a desk or watch television during treatment. Do not attempt to drive or operate any dangerous tools or machinery during treatment. Power will turn off automatically at the conclusion of the timed cycle. Always complete a CES session. When the timed session ends, and a “heavy” feeling is still experienced, resume treatment until at least 2 minutes after the heaviness lifts and a light feeling develops. Failure to do this can result in disorientation that can last for hours to days. Some people benefit the most from several hours of treatment in a given treatment session. Remove and discard EEPS. Clean and dry Earclips and replace 4 EEPS for the next treatment, if desired. EEP case opens with label on bottom. Store Alpha-Stim AID away from children. CES may be used as often as necessary but for most people it is best to treat between once a day and twice a week. Results usually improve and last longer with additional treatments. Plug dual connector end of wires into Channel 1 or Channel 2 jack and pin plugs into Smart Probes. Apply Probe Electrode Pads (PEPS™) to Probes by placing clean Probe tip into PEP™ in PEP™ case. PEP™ case opens with label on bottom. Set Frequency to 0.5 Hz or desired setting. For joint problems (e.g., shoulders, elbows, wrists, fingers, hips, knees, ankles, toes) use 100 Hz for 10 – 20 seconds immediately followed by 0.5 Hz. Try 1.5 Hz if 0.5 Hz is not effective. Set Timer to Probe setting. Set Current on Channel in use to 6 (600 μA). Decrease immediately if uncomfortable. When used on or near the head, immediately decrease the current if dizziness or nausea develops. This may happen initially or several minutes into treatment. Decreasing the current will immediately relieve these unpleasant feelings. Saturate PEPS™ thoroughly with several drops of Alpha Conducting Solution™ (ACS). Repeat as necessary throughout treatment. Note level of pain for all areas being treated and any limitations of movement in joints before, during, and at conclusion of treatment. It helps to keep a diary of pain levels where 0 is no pain and 10 is the worst the pain being treated has been, along with time of day, duration of treatment, frequency and current levels used, and the most effective electrode locations. Apply Smart Probes to clean, dry skin. Cycle will start with 2 beeps on contact with skin and end with a single beep. Hold Probes firmly against skin for the entire 10 second cycle before moving to next treatment location. Lift Probe off skin and replace to repeat treatment at the same location. See Smart Probe Treatment Strategies for guidelines for Probe placements. Always place the Smart Probes to direct the current between them through the area being treated. Two Smart Probes must always be used together to complete the electric circuit. Continue treatment until pain is completely gone or maximum relief is achieved. There is usually an increased range of motion in treated areas. Sometimes treated areas of the body feel stiff or tight after the pain is gone. This will wear off over time. Finish with Cranial Electrotherapy Stimulation. Repeat as necessary. Results usually improve and last longer with additional treatments. Store Alpha-Stim M away from children. We offer free technical and clinical support for our customers and healthcare practitioners. + 940-328-0788 outside of the U.S.
Plug dual connector end of wires into Channel 1 and/or Channel 2 jack and pin plug into AS-Trodes™. Mute the beeping if desired with the key sequence: Lock-Timer-Lock. To reinstate the audio alert press the same key sequence. Set Frequency to 0.5 Hz or desired setting. Set Timer to 10, 20, 40, 60 minutes or Continuous. This depends on the length of time necessary to effectively manage your pain. The cause and severity of the pain, your overall health, and any ongoing physical or psychological stress that might add to your condition are some of the factors determining length of treatment. Standard treatment time is 20 minutes to 1 hour per AS-Trode™ location. Additional treatment time is usually not necessary. 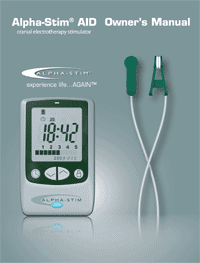 The Alpha-Stim® M may be used continuously all day for months or even years in severe cases but such usage is rarely necessary. Set Current on the Channel(s) in use to desired setting. Use 6 (600 μA) for maximum pain relief; decrease immediately if uncomfortable. Use 1 (100 μA) when using AS-Trodes™ for over 1 hour; increase as necessary to obtain relief, but reduce current to lowest possible effective level (but not less than 100 μA) when used for long periods of time. This has shown to provide better results than when maintaining the maximum current level. Press Lock button twice to lock settings if desired. Press Lock button twice again to unlock and change setting if necessary. Note level of pain for all areas being treated and any limitation of movement in joints before, during, and at conclusion of treatment. It helps to keep a diary of pain levels where 0 is no pain and 10 is the worst that area of pain has been, along with time of day, duration of treatment, frequency and current levels used, and the most effective AS-Trode™ locations. Peel the self-adhesive AS-Trodes™ off of the protective backing. Save the backing for storage of the AS-Trodes™ after use. If the adhesive dries out and the electrodes do not stick well, you may wet them with a few drops of Alpha Conducting Solution™ (ACS) and lightly rub your finger over the electrode to spread the solution into the electrode gel. Be careful as too much ACS™ will saturate the AS-Trodes™ decreasing their ability to adhere to the skin. Apply AS-Trodes™ to clean, dry skin. Always place the AS-Trodes™ to direct the current between them through the area being treated. Two AS-Trodes™ must always be used in pairs to complete the electrical circuit. Figure 10. Move AS-Trodes™ around as necessary to obtain the best results. Continue treatment until pain is completely gone or maximum relief is achieved. There is usually an increased range of motion in treated areas. Sometimes areas of the body feel stiff or tight when the pain is alleviated, but this will wear off after a brief period of time. Replace AS-Trodes™ in bag and seal bag. Discard and replace electrodes when adhesive has split or worn through to the conductive backing. Use only EPI AS-Trode™ brand silver electrodes available through your authorized Alpha-Stim distributor. Many electrodes are significantly less conductive and will not allow the Alpha-Stim current to penetrate the electrical resistance of the skin.